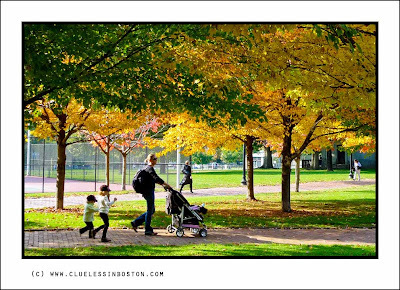 Under the leaves by the tennis courts on the Boston Common. PS - I was scanning thru some of your recent posts. You know that your already wonderful street scene photos are going to be viewed as treasures years from now. I like the canopy idea; lovely saturated Fall colours. This is a perfect picture. I love the light on autumn afternoons. Beautiful moment in such a fabulous scenery! I love the echo of stride in that family of three walkers. The trees are so beautiful at this time of year! Beautiful - I like the way you include people in your landscapes - they really add to the shot. Thats Beautiful! we dont have fall here. We are truly missing out! Beautyful autumn light for a peaceful day.. Fantastic light here and painter's colours.